Looking for a job in Hendry County Florida? 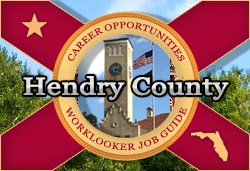 This Hendry County Florida job guide is a resource for job seekers looking for legitimate employment opportunities in the region with an emphasis on government positions, top healthcare employers, public school careers, and major job boards. Hendry County Florida is an excellent resource for ongoing employment opportunities. A survey of open positions found on this review date included Veteran Services Driver, Library Assistant, Surveyor, Paramedic, Emergency Medical Technician EMT, Emergency Management Technician, and Permit Technician. Check for current listings. Hendry County Sheriff's Office Employment page provides applications and job postings when vacancies exist. During review there were open positions available for Deputy Sheriff and School Resource Officer. The City of Clewiston periodically hires. Job postings found during this review for Clewiston had included Mechanic I, Part Time Custodian, Florida Certified Police Officer, and Communications Officer (Dispatcher). If you are looking for a career with the most successful agribusinesses in America, take a closer look at U.S. Sugar. A sample of open positions found on this review date had included Production Maintenance Technician Railroad, Utility Worker, Mechanic Welder Millwright, Electrician-Licensed Journeyman, Journeyman Mechanic, Filter Maintenance Journeyman Operator, Financial Analyst I, and Shift Mechanic (Journeyman). Everglades Harvesting & Hauling, Inc. represents four generations of Florida growers who actively operate a diversified company specializing in all aspects of the fruit and vegetable business. Here you may find employment opportunities such as Experienced Tireman, Truck Service Jobs, Experienced Crewleaders, CDL Class B Jobs, Experienced Mechanic, Experienced Welders, Experienced Tractor Trailer Drivers, Citrus Hauling Jobs, and Experienced Laborers. Kelly Tractor had been hiring in Clewiston for Lowboy Driver (Heavy Equipment), Technicians/Mechanics (Heavy Equipment), and Technicians/Mechanics (Agriculture Tractors). Winn-Dixie associates have the chance to thrive on the job while building exciting, fun and rewarding careers. Winn-Dixie offers a flexible schedule, competitive pay and associate discounts. Eligible associates also receive paid holidays and vacation, paid training, tuition reimbursement, 401(k) matching and a competitive benefits package. Good Wheels is a major transportation provider in Southwest Florida. Good Wheels was hiring School Bus Drivers on this review date. Check for new listings. Hendry Regional Medical Center is a 25-bed critical access hospital that incorporates modern technology with state-of-the-art medical staff to care for its patients. A survey of open positions available had included Inpatient Coder, Per diem Registered Nurse Jobs, Medical Technician, Per diem Medical Technologist, Registered Nurse PCU, Registered Nurse Med Surg, Per diem Pharmacist, Outpatient Coder, Pharmacy Technician, Per diem Speech Therapist, Housekeeper, Certified Nursing Assistant CNA, PBX Operator, ER Registration Clerk, Certified Medical Assistant, Licensed Practical Nurse LPN, Med Surg CNA, Ultrasound Technologist, Progressive Care Nursing Jobs, Clinical Coordinator, Per diem Ward Clerk CNA ER, Per diem CNA Monitor Tech, and Per diem RN Nursing Supervisor. Oakbrook Health and Rehabilitation Center specializes in skilled nursing and rehabilitation services. During review there had been openings for Certified Nursing Assistant, Assistant Director of Nursing, and Admissions Coordinator. Crossroads Behavioral Health Center is a full service behavioral health agency specializing in mental illness, drug abuse, and other psychosocial challenges. Water's Edge Dermatology seeks qualified and compassionate professionals to join our team of dedicated providers and staff. Hendry County District Schools has a high volume of employment opportunities available on an ongoing basis. A survey of open positions found on this review date had included School Administrator, Teacher for Nursing Assistant Course, Part-time Adult School Teacher, School Clerical Jobs, School Secretary, Media Specialist, School Couselor, Elementary Teacher, Art Teacher, Elementary Art Teacher, 5th Grade Teacher, ESE Teacher, Custodial Jobs, Elementary Teacher ESE PreK (Inclusion), Pre-K Teacher, 4th Grade Teacher, 3rd Grade Teacher, Middle School PE Teacher, 2nd Grade Teacher, ELL Paraprofessional, ESOL Paraprofessional, Vocational Skilled Trades Teacher, High School Art Teacher, Language Arts Teacher, Reading Teacher, High School Teacher (ESE), High School Teaching Jobs, Science Teacher, School Custodian, Middle School Teacher, PE Teacher, English Teacher, Instructional Assistant, Paraprofessional Jobs, Title I Paraprofessional, Pre-K Paraprofessional, Pre-K ESE Paraprofessional, Clerk Typist, Sign Language Interpreter, Speech/Language Pathologist, School Bus Driver, and more. The King's Academy located in Clewiston accepts applications for faculty and administrator positions are accepted all year. Talented teachers, high academic standards, and the development of leadership skills in a Christian environment are hallmarks of a TKA education. TKA offers students the opportunity to explore areas of interest and excel in areas of giftedness, while making lifelong friends. At the foundation of Discovery Day Academy is a passion for learning. A supportive and encouraging environment fosters the character development of each child. Creative approaches encourage deep learning and individuality. Children are empowered with academic knowledge, worldly perspectives and 21st century skills, setting the foundation for global competitiveness. This is a great jobs resource for Clewiston and Labelle, FL. During this review jobs were available such as Accounts Payable Clerk, Elementary Teacher, Farmworkers and Laborers, Crop Farm Worker, Farm Laborer, Merchandiser, Vegetable Hand Harvester, K-12 Education Advisor / Counselor, Wildland Firefighter, Production Maintenance Technician Railroad, Customer Service Representative, Financial Analyst, Head Cook, Science Teacher, Speech Language Pathologist, Housekeeper, Housekeeping Jobs, Registered Nurse RN, Electrician, Utility Worker, Farmworker Tomatoes, Farm Equipment Mechanic, Quality Control Assistant, Carpenter, Tractor Driver, Mechanic Assistant, Certified Nursing Assistant (CNA), Electrician Helper, Food Service Worker, Middle School Teacher, Band Teacher, and more. CareerSource Heartland offers workforce development opportunities for businesses and job seekers in DeSoto, Hardee, Highlands and Hendry Counties. Hendry County Economic Development Council's site provides a jobs page. Their website is also an excellent resources for exploring how to start a business, cost of living, demographics, and more. Their business directory can be used to find local businesses. Florida Heartland Economic Region of Opportunity provides a listing of Hendry County major employers. This Worklooker directory includes Naples, Marco Island, NCH Healthcare System, Physicians Regional Medical Center, Collier County Public Schools, Bonita Springs Charter School, Gulf Coast Charter Academy South, and more. This Worklooker directory includes Palm Beach Gardens, Boca Raton, Boynton Beach, Jupiter, West Palm Beach, and other locations. Top employers include Tenet Health Careers, JFK Medical Center, and Palm Beach County Public Schools. This Worklooker Lee County directory includes Southwest Florida International Airport (Lee County Port Authority Employment), Cape Coral Hospital - Lee Health System Jobs, NCH Health System, Lee County Public Schools, Florida Southwestern State College, Lee County Sheriff's Office, and other prominent employers.